Red Star Research Papers evaluate Alexander Bogdanovs novel that imagines a Marxist society living on the planet Mars. Research papers on Red Star by Alexander Bogdanov look at how Utopian fiction often has themes closely related to historical events. The writers at Paper Masters will explicate Red Star for you and show you exactly how it ties into Russian history. Utopian fiction was a popular genre across Europe and the United States in the late 19th century and early 20th centuries. Works such as News From Nowhere and Looking Backward envisioned futuristic societies where the ills of the day (mainly rampant industrialization and labor strife) were solved by the benefices of socialism. 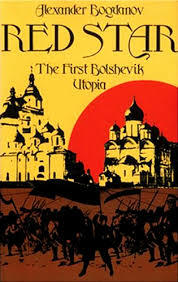 It is no surprise that a utopian work of fiction came out of the socialist struggle in Russia, Alexander Bogdanov’s Red Star. Rather than project the ideals of socialism into the far off future, Bogdanov imagined a Marxist society living on the planet Mars. Astronomers and writers alike were alive to the idea of an alien society on Mars; Bogdanov placed the failed desires of the 1905 Revolution in his imagined society. The Martian society conceived by Bogdanov is a curious marriage of projected technology and Marxist structure. Early in Leonid’s journey to Mars, he asks about how the Martians were able to develop interplanetary communication. Netti remarks: “At first, however, we could produce only insignificant quantities of it, so the efforts of a great many factory teams were required to find and develop the means of manufacturing it on a large scale”. It is curious that Bogdanov cannot conceive of an advanced technology outside of the confines of 19th century industrial structure. One imagines these “factory teams” akin to the ideals of Marxist and labor unions, with the workers controlling the means of production and existing in a management-free environment. The Martian workers are united in a common struggle, one that organizations such as the AFL or the Knights of Labor dreamed of. One of the identifiable features of Marxist societies, the USSR and China, was the adoption of a drab proletariat uniform. Leonid describes the Martian dress in such a manner—“simple, comfortable, without any superfluous conventional items such as ties or cuffs”—as an understanding of the collective nature of Martian society. The Martians are equally as functional in their conversation as their dress. Factory workers are described as “inquisitive, learned observers” rather than physical laborers, and all labor is voluntary. The factory that Leonid visits operates six hours a day, with most workers putting in about two hours’ work. Collectivization is so total in the Martian society that older members choose to commit suicide in the hospital rather than become a burden to society. Shades of Soylent Green aside, the collective society of Mars is total, without much regard to individualism other than one’s desire to perform a certain type of work. Red Mars Research Papers discuss a science fiction novel about the colonization on Mars, and the different issues they may encounter. Karl Marx - For Karl Marx, social inequality was seen as evil and something that needed to be replaced within society. Marx and Class Struggle - Marx and Class Struggle research papers from Paper Masters are based on Karl Marx's research on social class. News from Nowhere - News from Nowhere by William Morris is representative of the Utopian genre. Paper Masters writes custom research papers on Red Star and evaluate Alexander Bogdanovs novel that imagines a Marxist society living on the planet Mars.